_The guitar led intro track kind of crashes into the first song proper but quickly enough we are into some full blooded heavy rock. 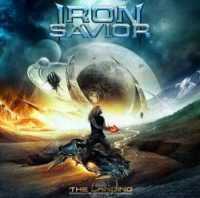 The riffs battle the vocals for supremacy throughout “The Savior” and whilst it is a simple arrangement it is still a strong start. And so it continues. its interest. There are a couple of welcome diversions musically but on the whole it’s standard fare. Reading more on Mr. Sielck I noted that he has worked in some capacity with Uriah Heep (I have no idea about how) and going back to “The Savior” it did sound like a heavy Heep track. As the album progresses there are some good attempts to change the sound whilst remaining true to the power theme. The starting riff to “March Of Doom” continues through the song and gives a varied back drop to the vocal whereas “Heavy Metal Never Dies” slips back to the earlier straighter sound, more metal than the rock of “The Savior”. “Moment In Time” takes a few newer steps with a funky bass opening and a very different feel to the whole song and it is nice to see what is ostensibly a power metal band take its third step a little way outside the normal sound. The remaining tracks follow the same pattern with plenty of regular power metal and even more variations. There is also space for something a little more balladic with “Before The Pain”. It’s a good mix on the album and the straighter heavy metal and hard rock parts show the musicans in the best light. I can’t help feeling that the vocals are key to the album and without Sielck they could be a run of the mill band. But they do have him and have therefore produced a decent album.